Case is in polished steel with solid case back. Other features include screw down crown with protective horns, domed acrylic crystal, screw in back and water resistance to 20 ATM. Verified Owner Comments: Watch Buys communication throughout the buying experience was very good. My Sinn 103 arrived on time and is everything I expected. Verified Owner Comments: I went back and forth on what chronograph I wanted to add to my collection. The 103 ST kept drawing me back. I won't usually purchase without trying a watch on, but took a shot. The watch is fantastic, wears great, bracelet is very comfortable. This is a great everyday watch. I would highly recommend it to those in the market for a classic chronograph. Verified Owner Comments: I was looking for a pilot’s chronograph with provenance, and considered a number of the classics, including the Omega Speedmaster, Breitling Navitimer, and Porsche Design Chrono 1. I time a lot of things and the combination of the timing bezel and chrono is much more useful than either complication alone (I often am using both simultaneously, the bezel for events under 60 minutes and the chrono for those over 60 minutes). The legibility is unsurpassed in its class, the lume is excellent, and the dial design is both classic and beautiful. I never tire of looking at the dial. Sinn is a great brand, with aviation, military, and tool watch provenance. Delivery was rapid and Rob and Matt are a pleasure to deal with. "Sinn 103 St Acrylic on Bracelet"
Verified Owner Comments: Meticulous craftsmanship and time honored German engineering and design are what this watch is all about. The case and bracelet are solid and the domed Acrylic crystal hardens back to the classic pilot watches of the early 1960's. Extremely accurate movement. My watch gains approx. 1.25 seconds per 24 hour period.....chronometer grade. 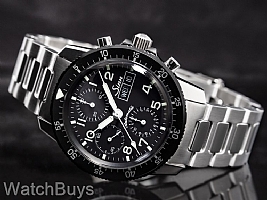 Wonderful classic, rugged, accurate, timepiece. Verified Owner Comments: I've had this watch for about 1 month now and smile every time I see it. The Breguet numerals, domed acrylic crystal, and friction bezel all work so well together to give a warm, vintage feel. The watch exudes quality and the Valjoux 7750 has been extremely accurate with no break-in period. 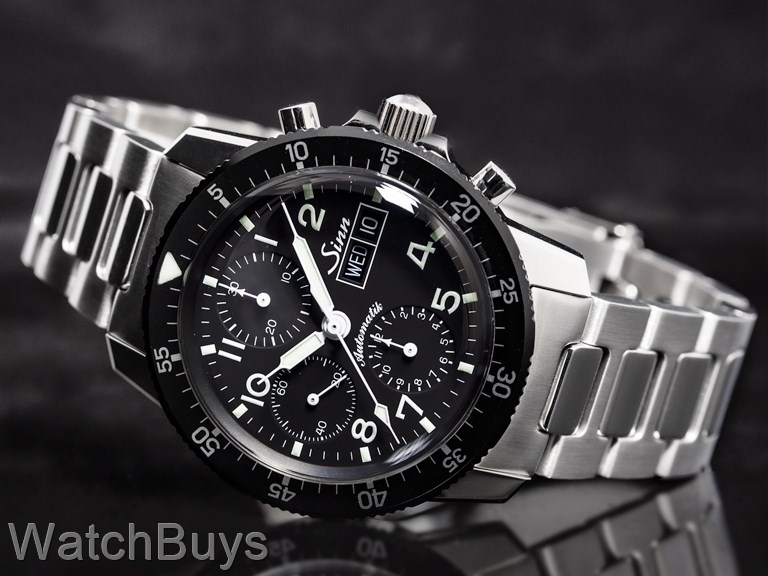 Furthermore, the staff at WatchBuys were very knowledgeable and professional. Highly recommend not only this watch, but also working with WatchBuys!!! Verified Owner Comments: High quality watch, exceeds accuracy average for this movement. Versatile both on bracelet and straps. Buying process was seamless, Matt, Rob, and Watchbuys staff were very patient with all of my questions and provided speedy shipping to accommodate. Definitely recommend this watch and Watchbuys. Verified Owner Comments: Bought it and thought it was one of the best watch I have ever owned. Beautiful, classic and classy, very accurate. A must have if you like classic watches.